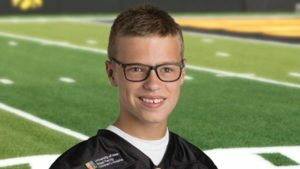 A Prairie City boy will celebrate his 14th birthday Tuesday by serving as “Kid Captain” for the Iowa football team as the Hawkeyes play Mississippi State in the Outback Bowl. Gabe Graber’s mother, Emily, says her son was born on January 1, 2005 with a rare birth defect. “Gabe’s congenital heart defect is called double-inlet left ventricle, which means that his right ventricle never fully developed, and his left ventricle is responsible for handling the whole function of his heart,” Emily said. Gabe had two heart surgeries before his third birthday. During his second surgery, Gabe suffered a stroke that left him paralyzed on his left side. But within two months, he was walking again. Gabe’s parents made their comments in a video produced by the University of Iowa Stead Family Children’s Hospital. This marks the 10th year for the UI Kid Captain program. The Outback Bowl in Tampa, Florida kicks-off Tuesday at 11 a.m. (CST).